I began my last post with this: Is Parkinson’s curable? My answer is Yes, Parkinson’s is curable! This is what you need to know in your heart. Every disease was incurable until somebody got cured. So far, there are four of us who have done the Parkinson’s Recipe for Recovery® and become cured from Parkinson’s. Isn’t it time for you to acknowledge that Parkinson’s is curable? When somebody says that Parkinson’s is incurable, it says nothing about you, nothing about Parkinson’s, and nothing about Parkinson’s being curable or not. Instead, it says the person is lacking in hope and faith. So, have compassion for the person because one who is lacking in hope and faith is suffering and could use your compassion. 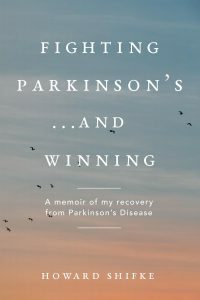 When somebody says it is impossible to recover from Parkinson’s, it says nothing about you, nothing about Parkinson’s, and nothing about Parkinson’s being recoverable or not. Instead, it says the person is lacking in hope and faith. So, have compassion for the person because one who is lacking in hope and faith is suffering and could use your compassion. Responsibility. To say that Parkinson’s is “IN CURABLE” and “I’M POSSIBLE” in your Parkinson’s recovery requires you to take responsibility for being your own cure. Face it, the ones who are offering you pills or shots or surgery or formulas or machines do not believe you can be cured so they are not trying to help you recover from the disease…you have to know you can recover and take responsibility to be your own cure. Being responsible for being your own cure is daunting for some people. You have become reliant upon others to “cure” you from your maladies, so when the others say, “There is no cure for your Parkinson’s,” what other choice do you have? You either accept what the others say that you cannot be cured, or you say, “I refuse to accept the status quo. I have the power to heal myself…and I will!” This makes you your own cure. I think you get the point. Everything was “great!” Why? First, because that is exactly what was happening in my body and I knew it. Second, because even if it was not exactly what was happening in my body, I had Plan A only, no Plan B, so fear of Parkinson’s was a luxury I could not afford. I forced myself to find something “great!” about whatever was going on. Here is the mind I had to lose. I had to lose my Adrenaline-mode mind. I had to lose my I-need-to-do-everything-perfectly mind. I had to lose my I-need-to-be-in-control mind. I had to lose my you-are-not-worth-it mind. I had to lose my It-is-not-okay-to-like-yourself-or-love-yourself mind. When I lost that mind, then, and only then, did I completely come to my senses. The whole world changed. Actually, all that had changed was me. I started viewing the world from my heart, filled with compassion, and there I have stayed. Thanx for your support, commitment, and encouragement, Howard. Your companionship on this journey is priceless! Fabulous! I love it, I love it, I love it. With Love and Massive Gratitude! What??? Im possible…? in curable…? But of course….everything is possible if I take responsibility for my own choices…. and everything is curable if approached and authentically owned from within… so all I need right now is faith, commitment and openness… and my community of fellow PD travelers … Thank you Howard for your continuing wisdom, guidance and love! Howard you are the silver lining today. Thanks for sharing those really important ways of being. Our thoughts create our reality. Why not create one that works for you? I’m game! As i quote your commentary, albeit worth repeating, your timing and relevance of this posting could not of hit a more chronologically accurate heart string. As my body assumes a whole new series of uncomfortable biological protests i marvel at the symptoms that continue to demonstrated “gods” adoration of my existence. Our thoughts create our reality – O so true! I’m flying out to Australia tomorrow for a two week vacation, yoo hoo,! and to hell with PD and all its symptoms. Looking forward to fun and happiness with friends and family. Doing the recipe as I go. Unending thanks to Howard for his inspirational encouragement. Howard – thanks so much for your constant encouragement!! It is always helpful. Love and blessings. Am with you totally on that Melanie. I am so grateful for you Howard and this band of warriors as I realise more and more that most people do not view Parkinsons in this way and it can be quite a lonely walk swimming against the tide which is how I feel at times, but know that I know in my heart that this is completely right. I am thankful for friends who do understand, it helps. I am learning to take each day as it comes rather than let my mind go rushing off at a tangent trying to control everything – it does make life calmer but not always easy! But we can’t overcome unless we have something to overcome. Hi Tim, I just wanted to say ” hang in there” as you seem to be struggling with pain and extra challenge right now. Like Melanie and Cynthia above say, I hang out for my weekly fix of Howard and his Inspiration and my fellow Warriors for their share. I have had a few ” aha” moments recently through Howard’s words. One was when he said to me ” your soul does not have Parkinson’s” I was like “wow my soul is not affected by all these symptoms” It made something shift in me. My soul has my life path, it knows the script, so time for me to get to hell out of the way. My body is doing its best as I am doing the Recipe so that’s all in place…. So all that’s left is my thoughts, I can manage that with humour. I do ask God daily for strength and Acceptance that everything is as its meant to be right now, so help me stay with that knowing. I also feel empowered that from my physical ( doing The Recipe) to my mental ( paying attention to my thoughts) to my Spirituality ( giving God an earbashing most days-he has a sense of humour) in it all I am simply restoring balance to Karen. As Marie would say recreating ” a better version of me in the world”. Parky dishes its best on a daily basis and it is in knowing ” this too shall pass” I love a quote I heard ” If you knew the power that walks beside you, you would never doubt” 🙂 It is in all of us Tim, so fear not and stay strong my friend. With you and all my fellow Warriors, in Spirit. What beautiful, inspiring words from everyone. PD warriors, peaceful warriors. Sally sounds an absolute gem, and gift for you Howard, and you in turn are our gift. I feel stronger every day internally, thank God, thank all, thanks me. I feel stronger physically, although I have a gait/limp when I walk, and have difficulty writing etc, I am getting there from inside out. I am learning about love. Love of self and others. That’s a gift. Goodnight and thank you.